The thing about Wegmans is I can never seem to go just get what I planned on getting. I always end up walking around the store checking out whats on sale or if there are any new products. Well yesterday I noticed for the first time that there was a tea bar in the middle of the store. Its like a mini Teavana. Whats amazing is that they have this glass vases with all the teas where you can smell all the delicious aromas of each tea. 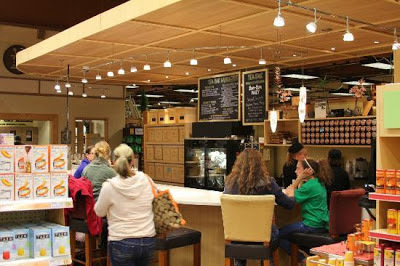 You can also order teas to enjoy at the bar or to-go while you are shopping around the store. They also sell tea cookies and scones for you to snack on with your tea. What's cool about this tea bar is that they are doing things with tea that I've never seen or heard of before. On their tea menu they a few unique drinks right including Chai Cider and Chai Eggnog. The amazing thing about the Tea Bar is that they brew their own chai, they don't use any mixes, so its delicious every time. Loose tea ranges from $1.80-$5.00 and if you order tea at the bar its about $3 after tax. They always have seasonal teas that taste and smell as delicious as they sound. Like right now that have teas like Almond Cookie, Almond Sugar Cookie, and Evergreen Mint. 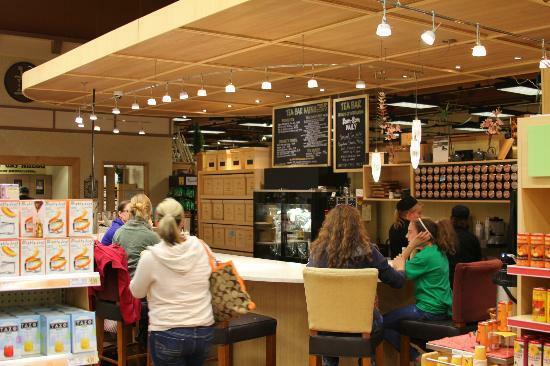 So if you are ever in the Pittsford, NY area make and craving a cup of tea or maybe need to pick up some groceries, make sure to stop by the Tea Bar to grab a cup or some loose tea to make at home.